The Senate public order committee sees no need to continue with its investigation on the public confession of former Davao City cop Arturo "Arthur" Lascañas, just six hours after he testified on the alleged killings committed by the so-called Davao Death Squad (DDS). 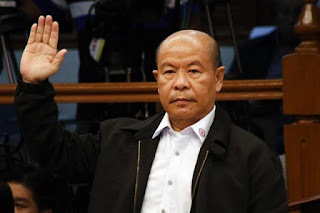 Senator Panfilo Lacson, chair of the Senate panel, said Lascañas' testimony has "no probative value," and that it is now up to the Philippine National Police (PNP) and the Commission on Human Rights (CHR) to pursue their own investigation. "We adjourned it kasi wala naman kaming nakita eh. Wala na. Ano pang pipigain mo? Nasabi na lahat," Lacson told reporters in an interview. "Nagdududa kami sa kanya ngayon. Kung tatanungin niyo ko 'alin ba ang totoo?' Hindi ko alam, nagdududa din ako," Lacson added. Chief Supt. Manuel Gaerlan, PNP-Region 11 police director, said during the hearing that they will look into the killings mentioned. He admitted that it was the first time they heard about the details of the cases Lascañas narrated. Lascañas made a complete turnaround from an earlier testimony he made in October. Back then, he denied the existence of the DDS. Last month, however, he executed an affidavit and made a public confession, saying the DDS exists and that he was, in fact, a "major player." He also said President Rodrigo Duterte, former mayor of Davao City, paid up to P100,00 per target. Lascañas narrated before the committee the alleged killings he was personally involved in including that of radio broadcaster Jun Pala, and the Patasaja family. The former cop said he lied under oath last year because he was "forced" to do so. He said he chose to tell the truth now because of a "spiritual renewal." Senator Manny Pacquiao, a staunch ally of Duterte, doubted Lascañas' claims and insinuated that he was paid to speak against the President. Lacson said the committee will recommend perjury raps against Lascañas when he comes up with the report, and likewise propose a bill that would increase the penalties for perjury. He said there is no need for President Duterte to answer the "extrajudicial confession" made by Lascañas. "Unang una, meron siyang immunity from suit. Pangalawa, hindi naman pwede gamitin, walang probative value yung so saan mo gagamitin? Ano sasagutin ng Pangulo?" Lacson said. During the hearing, Lascañas claimed personally killing up to 200 people when he was with the DDS. He said members of the DDS planted evidence on their victims, as he noted the similarities between the operations of the death squad and the alleged extrajudicial killings committed under the Duterte administration. "Kadalasan, usually kung palabas na legitimate ang operations pero pina-planting-an namin lalo na kung may pending na warrant of arrest, mas madali yun," Lascañas said. Asked whether some of the suspects fought back or "nanlaban," Lascañas said: "Sa 10 na operation, kung may manlaban na isa, milagro na yun." Lascañas said Dela Rosa, then head of the regional intelligence of Police Region 11, knew of their operation ordered by SPO4 Sonny Buenaventura against a Taiwanese national who had a rift with Charlie Tan. He said another incident he had an encounter with Dela Rosa was when the wife of Salik Muck Doom, who was abducted by the DDS, complained of the ransom demand. Lascañas also recalled that when then-Senior Supt. Dela Rosa was Davao City police director, there was a joint operation where they targeted the most wanted criminal of Davao del Sur, a certain Felicisimo Cunanan Jr. alias Sgt Sisi. He said Cunanan was killed in the operation while his two companions were left inside the vehicle. The two were brought to the office of the Heinous Crime Office and around midnight then Mayor Duterte and Dela Rosa arrived. He said Duterte hurled invectives at the two suspects and then ordered him and Dela Rosa to kill the two. But Dela Rosa told him not to follow the order of Duterte. “Ang sabi ni Dela Rosa, wag mong ituloy dahil kawawa yan. Sabi ko sa kanya paano pag nagtanong si Mayor, ang sabi ni Bato ako na ang bahala,” Lascañas said. When the shipment arrived, Lascañas said he received a call from the younger Duterte asking him to abort the earlier plan. "Bago ako makarating, sabi niya sa 'kin 'Arbor ko na lang, bro. Ako na lang bahala kay Charlie.' Dito nagkaroon ako ng maraming iniisip," Lascañas said. It was not clear when the incident happened and if the younger Duterte was already the city vice mayor. Lascañas said one of the motorcycle riders confronted Duterte and hit him in the face with a helmet. He said the rider was not aware that the sports car's driver was the younger Duterte. Senator Francis "Kiko" Pangilinan said it's still too early to say that Lascañas has lost his credibility. "Ang sa akin, seryoso pa rin yung kanyang mga alegasyon. Sabi nga ng Korte Suprema, yung admission against interest, matimbang din yan," Pangilinan said. He said there are still witnesses set to come out according to Senator Antonio Trillanes IV. "We need additional evidence and more testimonies apart from him and Matobato," Pangilinan said referring to Edgar Matobato, the first witness to accuse Duterte of having a hand in Davao killings.